Today we celebrate the feast of Saint Alphonsa. Sister Alphonsa is popularly known as a person who loved and invited loving suffering. She is called the “Little Flower” (St. Therese of Child Jesus) of India. Both of these claims draw our attention to the fundamental reality and truth of Jesus Christ as the only Son of God and the unique Savior of the whole creation. She was a Franciscan Clarist nun. Her life was confined within the four walls of the FCC Convent at Bharananganam. Annakutty was the childhood name of Alphonsa. Roughly translated it would mean ‘little Ann’. It is a typical christening name popular among the Christians of Kerala. Although the immediate attention is now focused on the name Alphonsa, reflection on the name Annakutty reveals not only her childhood goodness, virtues and trials, but also an often unsung story and history of the family values, faith practices and ecclesial foundations of the Christians in Kerala. Without any exaggeration, one can say that Alphonsa’s real foundation was laid in her childhood as Annakutty, in her Christian family upbringing. Annakutty was born on August 19, 1910. It was a premature birth, taking place in the 8th month of the pregnancy. This was the result of a diabolical shock her mother, Mary Muttathupadathu, received from the coiling of a rat snake around her neck in her sleep. Her mother died three months after birth and on her death-bed she entrusted Annakutty to the care of her own sister Annamma Muricken. With her aunt, Annakutty painfully and joyfully tried to overcome the inexplicable loss of her mother and motherly love. Annakutty’s father unwillingly agreed to placing the child with her newly found ‘mother’ with the sole motive of promoting an ideal upbringing which would make Annakutty more capable as a future house wife. Annamma Muricken educated her sternly. The family played a key role in her faith formation and love for Christ, especially through the prevalent practices of regular evening prayers, observance of weekly fasting and participation in the Eucharistic celebration. Fr. Romlus rightly emphasizes this role the family played in the life of Alphonsa in nurturing and deepening her Christian faith. However the most important fact is that Annakutty developed a personal devotion and love for Christ. This is the fruit of her genuine faith formation. It is also the first visible sign that faith was a lived experience in the childhood of Annakutty. In other words, Jesus Christ began to become a concrete personal relational reality for her. It is because of this relational realization of God’s love and knowledge of Jesus Christ that Annakutty began to yearn for sanctity. Later, the decisive Christian family upbringing of Annakutty paved the way to the fruit borne in her life as a professed Clarist nun at Bharananganam. It is important to remember that because of the unique minority status of the Christian community in India, and because of the apostolically rich traditional background of the Church in Kerala, any mention of Alphonsa will always have to be done in reference to the unique ecclesial nature of the Catholic Church in India. That is the tri-ritual communion and the Christian reality of India which is astoundingly ecumenical because of the presence of all the major tributaries of non-Catholic traditions. Hundreds of thousands of Catholics in Malabar and other parts of South India have faith in Sister Alphonsa and invoke her aid, for they are convinced that she is a person of uncommon holiness…What a power would she not wield over the minds and hearts of the Catholics of our country where her cause to be taken up. At a turning point in its history, when the Church has to face so many difficulties and trials, struggles and dangers different in character and different in scope from those which assailed her in the past, may we not hope that through her intercession the Church will overcome all obstacles and grow in strength and vigor? It is fitting that such a beautiful soul should have sprung up in the earliest and most prosperous home of Christianity in our country. Let us pray: Heavenly Father! In Your infinite love and mercy, you heed the prayer of Your beloved servant, Saint Rita. You graciously grant favors through her intercession, which are considered impossible to human foresight, skill and efforts. Relying on her compassionate love, we ask You to assist us in our trials and difficulties. Let unbelievers know that you are recompense helper of the humble, the defense of the helpless, and the strength of those who trust in You. We ask this through Jesus Christ our Lord. Amen. 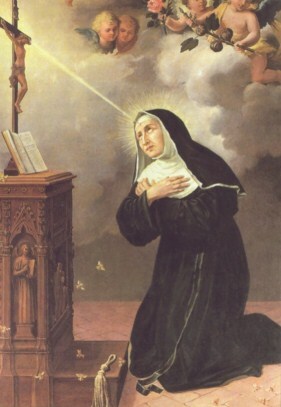 St. Rita of Cascia was an Augustinian Nun who lived in Italy between 1386 and 1456. She greatly desired to be a nun but was married at the age of 12 to a wealthy, cruel and immoral man. St. Rita endured his insults and abuse for 18 years. She gave birth to two sons. St. Rita helped convert her husband to lead a pious life. When her husband was murdered, she tried in vain to dissuade her twin sons from attempting to take revenge; she appealed to Heaven to prevent such a crime on their part, and they were taken away by natural death, reconciled to God. She was a model wife and mother in every aspect. After the deaths of her husband and sons, St. Rita miraculously entered the monastery of Saint Mary Magdalene at Cascia when she was 36. St. Rita is the Patroness of Impossible & Hopeless causes, Mothers and Abused Women. Many seek her intercession for marital problems, infertility and sickness. Her Feast Day is on May 22nd. The Novena begins on May 13th and ends on May 21st. Matthias was the apostle chosen by the remaining eleven apostles to replace Judas Iscariot following Judas’ betrayal of Jesus and suicide. His calling as an apostle is unique in that his appointment was not made personally by Jesus, who had already ascended to heaven, and, it was made before the descending of the Holy Spirit upon the early Church. All further information concerning the life and death of Matthias is vague and contradictory. According to Nicephorus, he first preached the Gospel in Judea, then in Ethiopia and was crucified. The Synopsis of Dorotheus contains this tradition: Matthias preached the Gospel to barbarians and cannibals in the interior of Ethiopia, at the harbour of the sea of Hyssus, at the mouth of the river Phasis. He died at Sebastopolis, and was buried there, near the Temple of the Sun. Still another tradition maintains that Matthias was stoned at Jerusalem by the Jews, and then beheaded. It is said that St. Helena brought the relics of St. Matthias to Rome, and that a portion of them was at Trier. Bollandus doubts if the relics that are in Rome are not rather those of the St. Matthias who was Bishop of Jerusalem about the year 120, and whose history would seem to have been confounded with that of the Apostle. The Latin Church celebrates the feast of St. Matthias on 24 February and the Greek Church on 9 August. Later, the Latin Church moved the feast of St. Matthias to 14 May.